Download "NOT TO BE PUBLISHED IN THE OFFICIAL REPORTS"
2 after hours dental treatment and extracted two of appellant s teeth. As a result, appellant suffered a nerve injury. Following a bench trial, judgment was entered in respondent s favor. The trial court concluded that workers compensation was the exclusive remedy for appellant s recovery. Appellant contends respondent s treatment was outside the course and scope of her employment and therefore, under the dual capacity doctrine, she can pursue her civil action for negligence. However, the trial court found that respondent was obligated to treat appellant at no charge as a benefit of her employment. Appellant has not challenged this factual finding as being unsupported by substantial evidence. Thus, there existed an employment related duty for respondent to provide dental treatment to appellant as one of the benefits of her employment. Therefore, such treatment became part of the employeremployee relationship and appellant s injury during the treatment was an incident of employment. Accordingly, the trial court correctly concluded that appellant s injury fell within the workers compensation scheme. BACKGROUND In December 2008, respondent hired appellant as a full-time employee to handle billing and accounts receivable and to serve as a receptionist for respondent s dental practice. Appellant s employment with respondent ended in May Respondent had an employee policy manual in effect during appellant s employment. This manual states that dental benefits for full-time employees and their immediate family members will begin after six months of employment. In October 2009, appellant began experiencing discomfort in a lower molar. On February 22, 2010, respondent extracted two of appellant s teeth. The procedure took place after regular office hours. The extractions caused nerve damage that is likely permanent. 2. 3 Appellant testified that she gave respondent $950 in cash for the dental work. However, respondent testified that he did not receive, nor did he expect to receive, payment from appellant. Respondent believed he was obligated to provide the dental services on February 22 because it was part of appellant s compensation package. An office ledger shows a charge of $1,430 for these dental services, reduced by a professional discount in the same amount, leaving a zero balance. 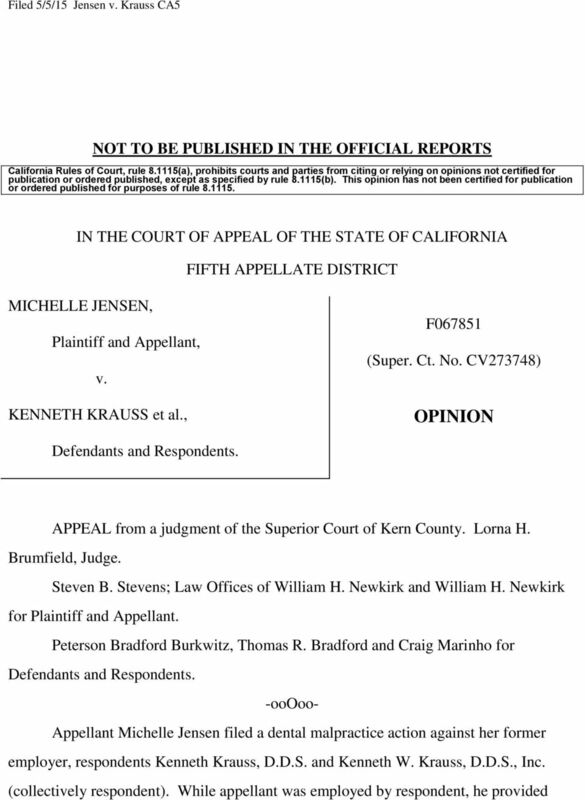 Appellant filed the underlying complaint for dental malpractice. The matter was tried to the court on the limited issue of whether appellant s civil action was barred by Labor Code 1 section The trial court concluded that appellant s sole remedy was a workers compensation claim and entered judgment in respondent s favor. In reaching its decision, the court found the following facts were undisputed: 1. Appellant was respondent s employee at the time of the incident on February 22, 2010; 2. Respondent had workers compensation insurance on that date that covered appellant; 3. 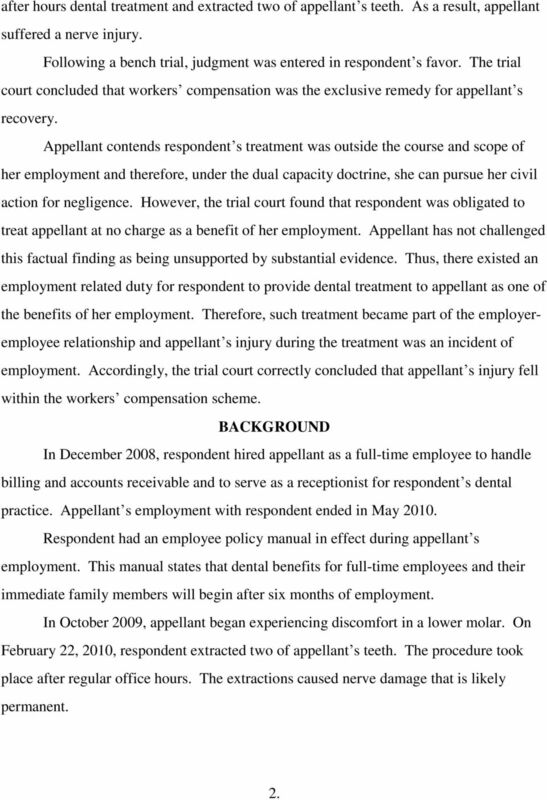 Appellant was clocked out at the time of the dental treatment and was not performing work for her employer; 4. Appellant s dental problems preceded February 22, 2010, and did not arise out of her employment; and 5. The dental treatment on February 22, 2010, caused appellant s nerve injury. The trial court made the following findings of fact on the contested issues: 1. 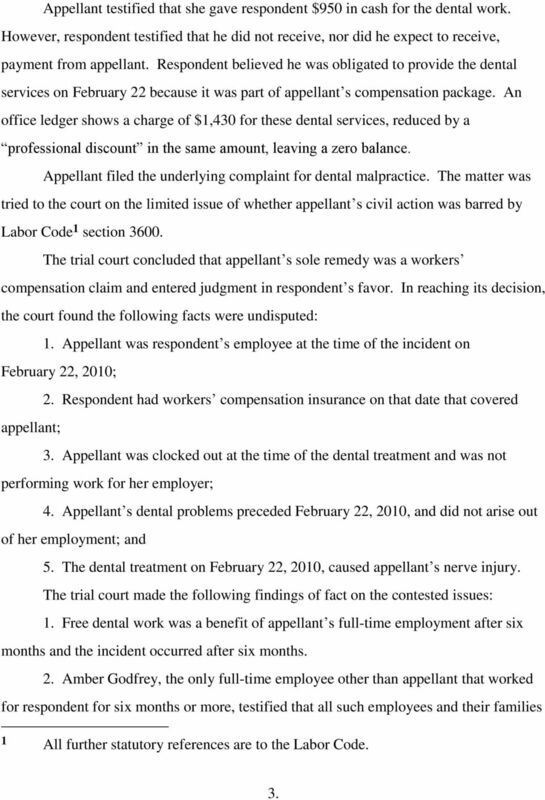 Free dental work was a benefit of appellant s full-time employment after six months and the incident occurred after six months. 2. Amber Godfrey, the only full-time employee other than appellant that worked for respondent for six months or more, testified that all such employees and their families 1 All further statutory references are to the Labor Code. 3. 4 received free dental care. The other employees who testified did not work full time for six months. 3. There was no evidence that appellant saw or signed the employee manual. 4. Appellant called respondent s certified public accountant whenever she had a question about benefits and he would answer her questions. There was no evidence that she called about dental benefits or asked him how much her procedure would cost. 5. Appellant testified that she paid respondent $950 in cash and presented a payroll check she cashed as proof. Respondent denied this and produced a document showing that the entire amount of $1,450 was written off as a professional courtesy. Appellant s credibility was called into question by an exhibit proffered by her. 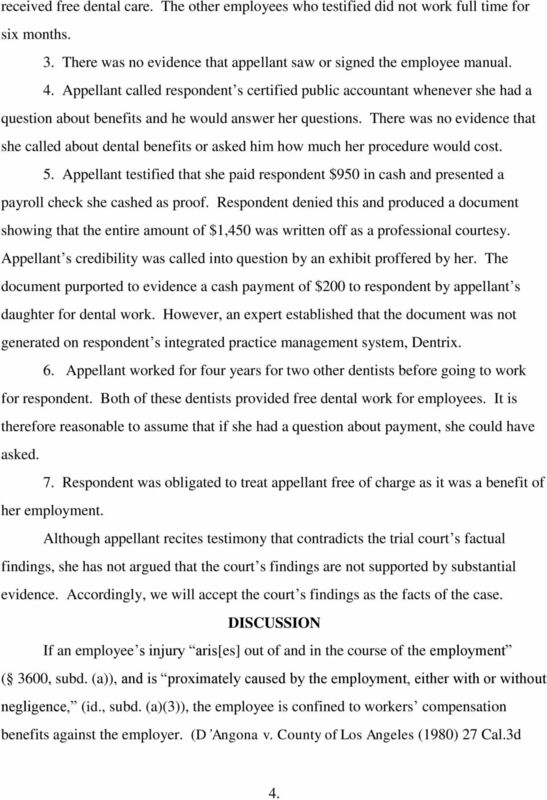 The document purported to evidence a cash payment of $200 to respondent by appellant s daughter for dental work. However, an expert established that the document was not generated on respondent s integrated practice management system, Dentrix. 6. Appellant worked for four years for two other dentists before going to work for respondent. Both of these dentists provided free dental work for employees. It is therefore reasonable to assume that if she had a question about payment, she could have asked. 7. Respondent was obligated to treat appellant free of charge as it was a benefit of her employment. Although appellant recites testimony that contradicts the trial court s factual findings, she has not argued that the court s findings are not supported by substantial evidence. Accordingly, we will accept the court s findings as the facts of the case. DISCUSSION If an employee s injury aris[es] out of and in the course of the employment ( 3600, subd. (a)), and is proximately caused by the employment, either with or without negligence, (id., subd. (a)(3)), the employee is confined to workers compensation benefits against the employer. (D Angona v. County of Los Angeles (1980) 27 Cal.3d 4. 5 661, 664 (D Angona).) An injury arises out of employment when the employment and the injury are linked in some causal fashion. Moreover, such connection need not be the sole cause but, rather it is sufficient if it is a contributory cause. (Maher v. Workers Comp. Appeals Bd. (1983) 33 Cal.3d 729, 734 (Maher).) The requirement that the injury be proximately caused by the employment has received a much broader construction in workers compensation law than it has in negligence law. It has been interpreted as merely elaborating on the general requirement that the injury arise out of the employment. (Maher, supra, 33 Cal.3d at p. 734, fn. 3.) Further, the injury need not occur while the employee is rendering services to the employer but may be sustained while the employee is enjoying a benefit of his or her employment. (Alander v. VacaValley Hospital (1996) 49 Cal.App.4th 1298, 1303 (Alander).) For an injury to be proximately caused by employment, it only must be such that without the employment, it would not have occurred. (Ibid.) There is a judicially recognized exception to the exclusive remedy restriction on actions against employers known as the dual capacity doctrine. (Hendy v. Losse (1991) 54 Cal.3d 723, 730.) This doctrine posits that an employer may have or assume a relationship with an employee other than that of employer-employee, and that when an employee seeks damages for injuries arising out of the secondary relationship the employee s claim is not subject to the exclusive remedy provisions of the Workers Compensation Act. (Ibid.) 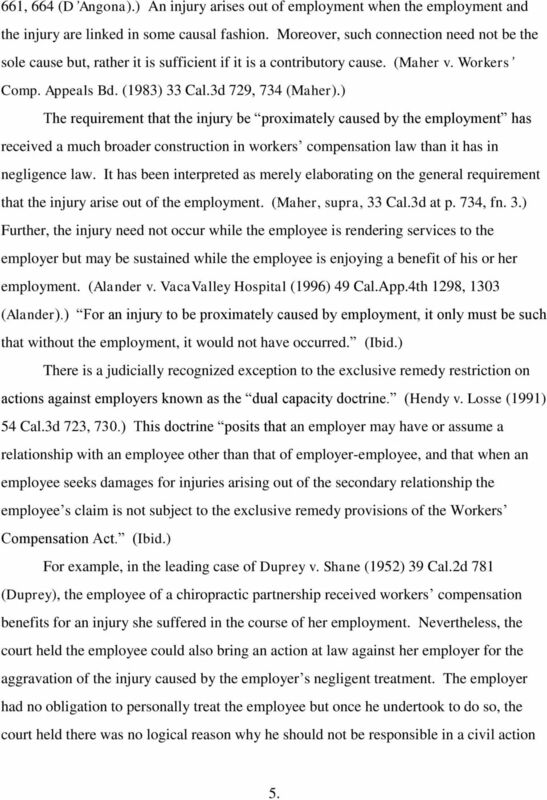 For example, in the leading case of Duprey v. Shane (1952) 39 Cal.2d 781 (Duprey), the employee of a chiropractic partnership received workers compensation benefits for an injury she suffered in the course of her employment. Nevertheless, the court held the employee could also bring an action at law against her employer for the aggravation of the injury caused by the employer s negligent treatment. The employer had no obligation to personally treat the employee but once he undertook to do so, the court held there was no logical reason why he should not be responsible in a civil action 5. 6 for negligence. The employer did not treat the injury because of the employer-employee relationship, but, rather, treated the employee as an attending doctor. Thus, their relationship was that of doctor and patient. (Duprey, supra, 39 Cal.2d at p. 793.) The Duprey rationale was followed in D Angona, supra, 27 Cal.3d 661, Sturtevant v. County of Monterey (1991) 228 Cal.App.3d 758, and Weinstein v. St. Mary s Medical Center (1997) 58 Cal.App.4th In each of these cases, an employee suffered an initial injury on the job and thereafter sought treatment for that industrial injury from a medical provider who also happened to be the employee s employer. Because the medical provider had no obligation to treat the employee, the court permitted a medical malpractice action against the employer to proceed when the medical provider s negligence aggravated the injury. (Weinstein, supra, 58 Cal.App.4th at pp ) However, when an employee obtains medical treatment from the employer under circumstances incidental to the employment relationship, workers compensation is the employee s exclusive remedy. For example in Bell v. Macy s California (1989) 212 Cal.App.3d 1442 (disapproved on a separate ground in Snyder v. Michael s Stores, Inc. (1997) 16 Cal.4th 991, 1000), the employer provided a first-aid dispensary and clinic for its employees. A pregnant employee became ill at work and sought treatment at the inhouse clinic. Because of the attending nurse s negligence, the employee s then unborn baby eventually died. The court held that in providing a medical clinic for its employees, the employer never stepped out of its role as an employer and into that of a medical care provider. 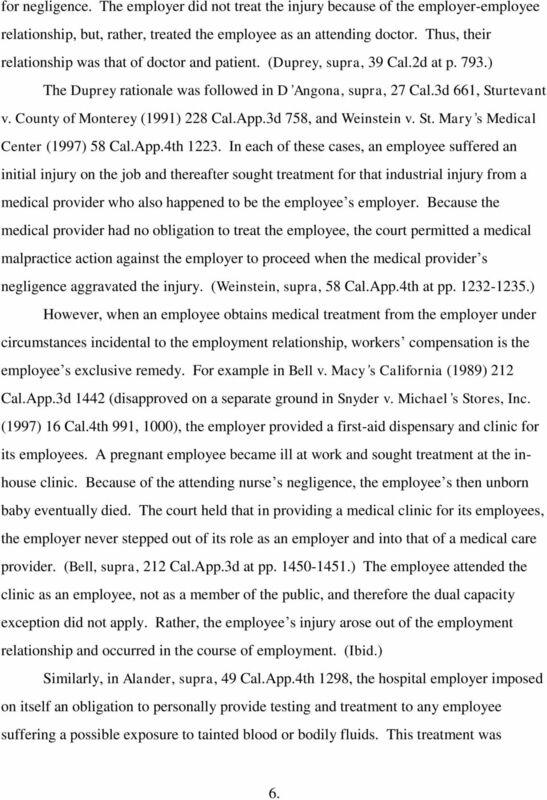 (Bell, supra, 212 Cal.App.3d at pp ) The employee attended the clinic as an employee, not as a member of the public, and therefore the dual capacity exception did not apply. Rather, the employee s injury arose out of the employment relationship and occurred in the course of employment. (Ibid.) Similarly, in Alander, supra, 49 Cal.App.4th 1298, the hospital employer imposed on itself an obligation to personally provide testing and treatment to any employee suffering a possible exposure to tainted blood or bodily fluids. This treatment was 6. 7 provided as an employee health benefit. While voluntarily undergoing treatment pursuant to this benefit, the employee suffered nerve damage. Under these circumstances, the court held the employee was injured in the course of employment. In electing to receive the treatment at the employer hospital, the employee was asserting her right as an employee to one of the benefits of her employment. Further, the employer was fulfilling its obligation under the employment protocol as an employer, and not as a medical provider. 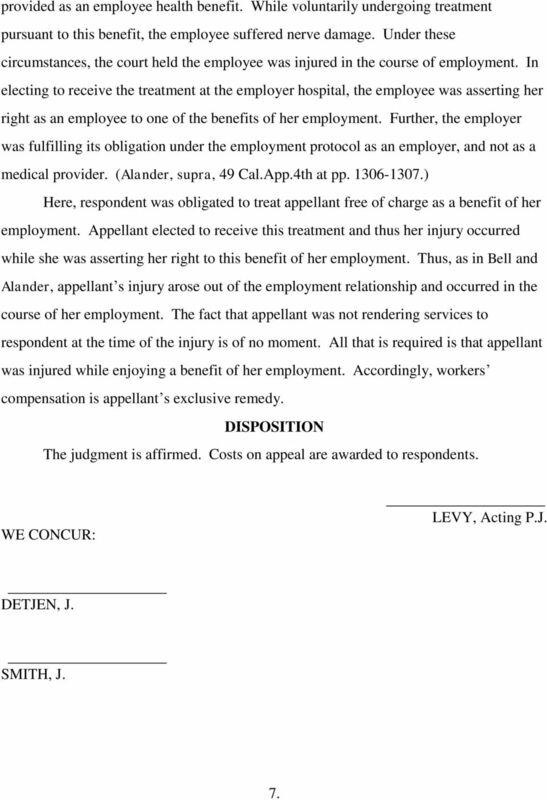 (Alander, supra, 49 Cal.App.4th at pp ) Here, respondent was obligated to treat appellant free of charge as a benefit of her employment. Appellant elected to receive this treatment and thus her injury occurred while she was asserting her right to this benefit of her employment. Thus, as in Bell and Alander, appellant s injury arose out of the employment relationship and occurred in the course of her employment. The fact that appellant was not rendering services to respondent at the time of the injury is of no moment. All that is required is that appellant was injured while enjoying a benefit of her employment. Accordingly, workers compensation is appellant s exclusive remedy. DISPOSITION The judgment is affirmed. Costs on appeal are awarded to respondents. WE CONCUR: LEVY, Acting P.J. DETJEN, J. SMITH, J. 7. IN THE SUPREME COURT OF MISSISSIPPI NO. 2000-CA-00099-SCT. AND ON BEHALF OF HER MINOR DAUGHTER, BRANDE SKINNER v. LISA GIBSON McKEE, M.D.